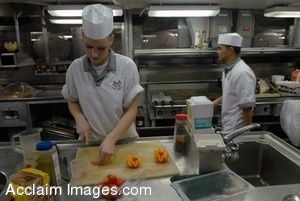 Description: Clip Art Photo of Navy cooks preparing food for the sailors(Nov. 6, 2008). Culinary Specialist Seaman Jessica Menz, from Minn., carves an orange and cherry tomatoes into a fruit sculpture in the Chief Petty Officer's Mess aboard the Nimitz-class aircraft carrier USS Ronald Reagan (CVN 76).(U.S. Navy photo by Mass Communication Specialist Seaman Apprentice Oliver Cole). Stock photography by Department of Defense Public Domain.